Is Simply Adding R-22 Enough? In Texas the number of residential homeowners who have had to add R-22 (Freon™) to their air conditioning unites have increased. Coupled with price increases for these kinds of products many Texan’s are saying their experience is “uncool” to say the least. Here is the thing, at the current rate we are going some predict a rise by double-digits in the upcoming year and the demand will drive up the cost as well as producers of the chemical cooling agent capitalize on the heat. But before you blame capitalism, it is important to consider the impact on pricing is largely due to the governmental mandate to phase out R-22 refrigerant products as the production of the agents is suggested to be a big contributor to the depletion of ozone in our environment. The expected termination of R-22 will come at some point in the year 2020. Already the supply has been reduced radically from 2016 by a whopping 28%! So, it is not the “greedy capitalists” after all, it is simple economics: supply and demand. Many people are taking the “Get it while you got it” approach and buying up the product further reducing the supply and increasing the cost. Others are simply opting to top off their AC Units. But considering that AC Systems are a closed system, the reduction of R-22 levels is not the issue. The underlying issue is a leak somewhere in your system. Simply adding more refrigerant may be a short-term solution due to lower costs, the sharp increase in supply and demand makes this a less likely alternative moving forward. To help offset the cost of replacing unites the United States Government has extended the $500 tax credits when homeowners buy new high-efficiency heating and cooling equipment, but these new purchases must be made before the end of 2016. When you combine this tax credit with rebates offered by certain manufacturers, the affordability factor increases. Perhaps it is high time to consider replacing your air conditioning system. If what we have shared with you today makes best sense for you, we would love to earn your business! Air Systems Texas is a locally owned and operated business that proudly serves Friendswood, Texas and the surrounding areas with the highest quality products and customer service. Air Systems Texas is highly qualified to remove your old system and install a new, more efficient air conditioning and heating system in your home. If you are a commercial business, we would like to ask for your business too. 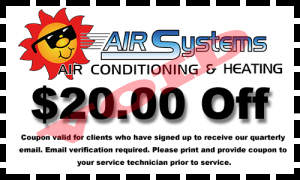 We proudly serve many businesses in our air with the best quality air conditioning systems available. Won’t you call us today? Our number is (281) 842-1125 –or– if you would prefer, you can use our convenient contact form below to reach us. At Air Systems Texas, we are proud to offer timely services and we are equally proud to have you as our clients and friends. Thank you for your business!